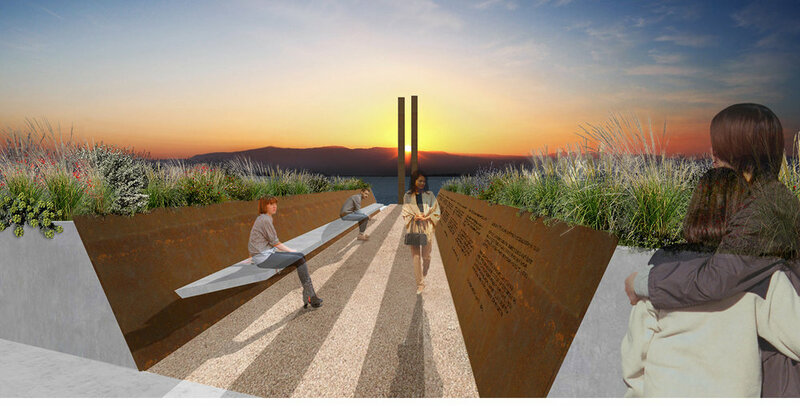 Description: In Meadow of Light and Shadow, two monumental beams from the World Trade Center Site are erected vertically near the waterfront, configured on axis to the World Trade Center site in New York City. The long linear shadows, cast by the beams at sunset in Redwood City on the anniversary of 9/11, cut through the coastal meadow. This gesture of a gash through the meadow evokes how the events of 9/11 unexpectedly changed our nation’s sense of peace and safety. On the anniversary of 9/11, visitors will see the setting sun dramatically framed by the beams. The dual beams become both the focus of the Tribute as well as our window to look through to the setting sun on the horizon at Bair Island. The sunset itself becomes a multi-layered metaphor: of hope and the future, or of the “sun setting” on an era before 9/11. 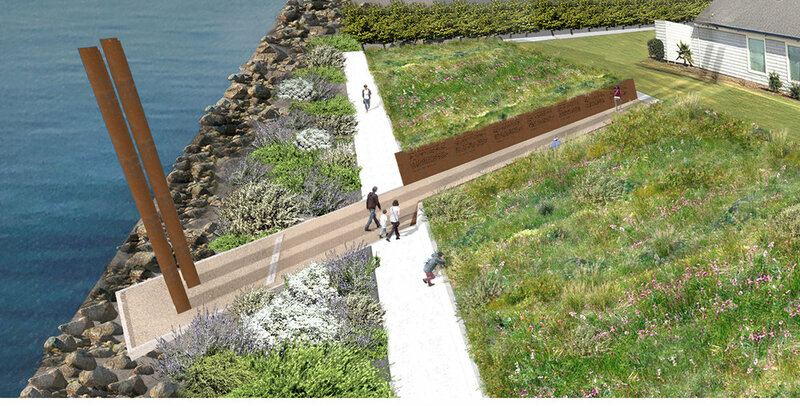 The beams’ shadows cut through the meadow garden; this gesture is repeated in the landscape as a linear pathway of decomposed granite, reinforcing the notion of a destructive cut into the earth. The pathway is further defined by angled retaining wall surfaces of weathering steel, as though the beams’ meaning-filled shadows have imprinted the materiality of the steel beams onto the landscape itself. A long concrete bench for seating is integrated onto one side of the pathway. On the other side, the weathering steel surface presents an interpretive timeline of the events of 9/11 and words of tribute to recognize First Responders within San Mateo County. Interpretive text honors those who daily serve to protect the citizenry and remembers those who have perished working tirelessly to safeguard the community. The text will be waterjet cut through to allow visitors to insert flower stems as a gesture of remembrance. 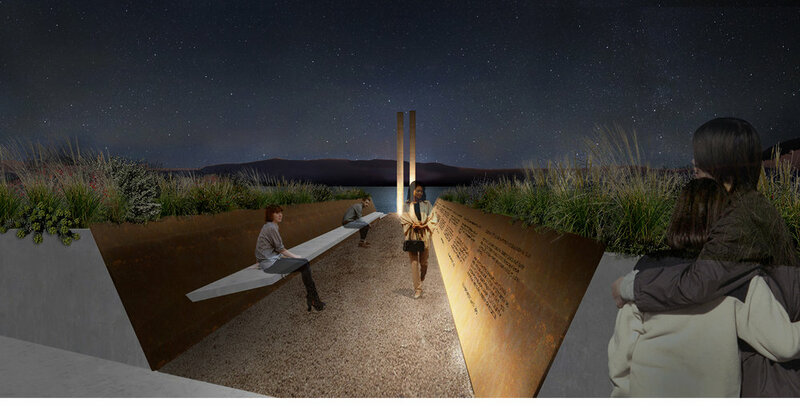 Meadow of Light and Shadow is radically site and time specific, taking inspiration from the powerful interplay between the two recovered World Trade Center beams and the peaceful garden setting envisioned for the Tribute by the community. The natural shifts of light and shadow become rich metaphors of peace, loss, memory, and hope. Unique views of the sunset and shadow on 9/11 set aside this day in a way that connects historical time with the movement of the earth.